Davie McCall is tired. Tired of violence, tired of the Life. He’s always managed to stay detached from the brutal nature of his line of work, but recently he has caught himself enjoying it. In the final instalment in the Davie McCall series old friends clash and long buried secrets are unearthed as McCall investigates a brutal five-year-old crime. Davie wants out, but the underbelly of Glasgow is all he has ever known. Will what he learns about his old ally Big Rab McClymont be enough to get him out of the Life? And could the mysterious woman who just moved in upstairs be just what he needs? Anyone who knows me personally, or through reading my blog, knows that I hate reading books out-of-order or part way through a series if there have been previous books with the same characters before it. It really unsettles me and throws me out my reading mojo. Yet, here I was agreeing to read Skelton’s Open Wounds which is book 4 in a 4 book series and I hadn’t read any of the previous 3 books! I’m not sure why I did this to myself. I knew that it was going to stress me out and put me a little out of step in the first place. Not because of anything to do with the book, but purely and simply because of how I am as a reader and this weird thing I have about needing to know the characters from the start. Anyway, to begin with, I did find it a little difficult to get settled into Open Wounds because there are mentions of people and events that have gone before and though, as with many books in a series, this can be read as a standalone because there was enough in the sentences to bring you up to speed, I still knew I was missing out and it irked that personal irky bit in me. Nothing to do with the book at all because the book is brilliant. Skelton’s tone and use of language evocative. 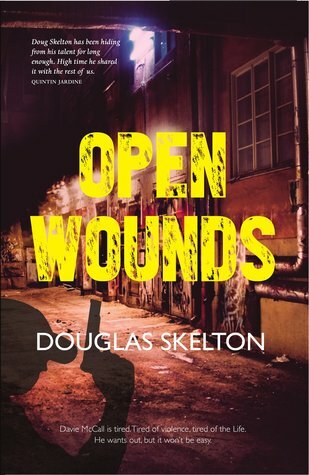 Open Wounds is set in Glasgow and has a brilliant Glaswegian feel to it. Not that I know what a Glaswegian feel is, but this is what I’d imagine it to be. The way the characters talked felt authentic. The setting is brought to life and is a character in its own right and the people are living breathing people rather than flat descriptions. I loved Davie McCall’s character, which is weird, considering. He was incredibly well drawn. His thought processes and motivations. His wants and desires. His steady pace. His moral code in a dark and sinister world. It’s a world of criminals and violence. It’s dark and brooding and it’s brilliant. For all my irkiness, I did settle in and became engrossed in Davie McCall’s world and it was because of Skelton’s fabulous writing that I was able to do this. I can’t really say too much else for fear of giving something away that I shouldn’t, but it’s a great read and I’d recommend you don’t read it – not until you’ve read the previous books in the series first, then read them all. There are only four, what are you waiting for! If you love dark Scottish crime with a balanced hand then this really is for you. With thanks to the author and publisher for my copy. I keep hearing great things about this series, Rebecca. And I do like the setting. It sounds, though, as though it’s more enjoyable if one reads the series in order. I’d probably want to, anyway, as I agree with you on that score. Glad you liked this! Definitely a series to be read in order, Margot. A great book. I’d have enjoyed the whole series. This is a new author for me. I shall see if I can find it. I love reading books in order. At the moment I read Allan Hunters all books about I so Gently. So far I read 4 and there’s plenty more. It’s a great read. I hope you enjoy them.